Calculus refers to a branch of mathematics which is mainly focused on derivatives, functions, limits, infinite series and integrals. This vital branch of mathematics is said to form a huge part of the modern mathematics education. It originates from defining the most basic physical properties of the human universe including the movements of molecules and planets. It approaches paths of moving objects including curves or functions and identify the most exact value of the said functions with an aim of calculating the rate of area, change or volume. Calculus is also said to be a major help when it comes to solving problems in the field of physics. It has been historically known as infinitesimal calculus or the calculus of infinitesimal. If you dream of becoming a certified calculus professional, then you have to know that this branch of mathematics comes with two major branches or divisions. These are the differential calculus and the integral calculus that are both effective in solving mathematical problems including velocity of moving objects within a specified period of time or the exact surface area of more complex objects such as lampshades. These two divisions can also be linked in some way to the fundamental calculus theory. It should also be noted that calculus is defined by experts as the study of change. It can also be defined as any calculation system or method fully guided by symbolic handling of expressions. If your major objectives include becoming one of the most renowned experts in the field of calculus, then you should keep in mind that Brainmeasures, a highly impressive and reliable online certification and skill testing company, offers a calculus certification program which is primarily designed to hone your skills and knowledge in this specific field. You can expect this calculus course from Brainmeasures to contain all the information that you need to become a calculus expert. This certification course makes it possible for you to enjoy a comprehensively designed calculus training which is effective when it comes mastering the basics of calculus, the basic principles that it follows, the functions of the two major divisions or branches of calculus namely the differential calculus and integral calculus and the specific problems that can be resolved by this specific branch of mathematics. 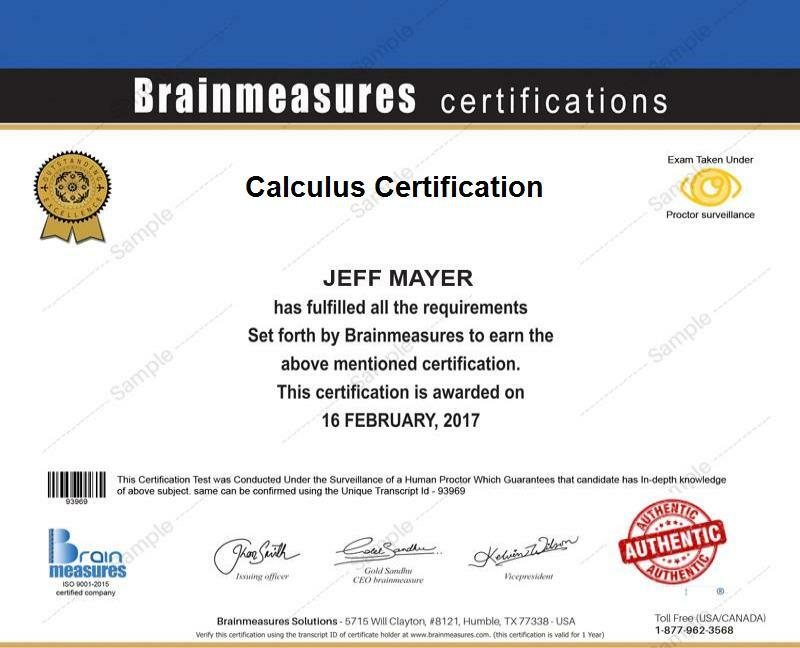 By enrolling in the calculus certification program offered by Brainmeasures, you will be able to receive a calculus certificate which is a strong indication that you are an expert in this field. How to evaluate limits using calculus? The calculus certification program which is now available at Brainmeasures is a huge help in your attempt to fully understand everything about calculus. This is most suitable for you if you aim to improve your calculus skills, master the steps involved in using simple integration, standard forms of integration and special and approximate integration methods. This is also a huge help for you if you are a math professional who want to fully understand the major functions of integration constant, improper, multiple and definite integrals and areas. Earning a calculus certification is a major help when it comes to easily accessing highly profitable jobs. Your calculus certification is extremely useful in your attempt to become a calculus teacher which allows you to receive at least $48,000 annually. Completing this certification course is also extremely useful in your attempt to become an expert mathematician which gives you an opportunity to receive around $54,000 to $116,000 every year.